We all know we need engaged employees who willingly work hard to give their best. Employee engagement is a win/win/win that benefits the employees, the organization they work in, and the customers they serve. But how do you get engagement? 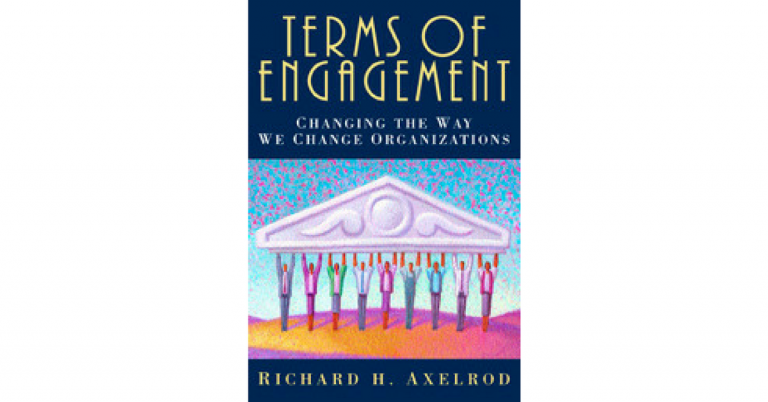 One expensive but solid approach to significant organizational change is the “conference model” advocated by Richard H. Alexrod in Terms of Engagement: New Ways of Leading and Changing Organizations. Terms of Engagement starts off by describing how the old model of organizational change simply doesn’t work well. It typically looks like this: Senior leaders and a select few participants come up with a change plan, then try to get the rest of the organization to go along with their plan. Alexrod lays out convincing evidence that a more democratic approach yields better results. What he suggests involves a larger number of people, who together generate the new vision, and design the work. Axelrod presents a number of excellent examples from his own real-world experience that make the theory come to life. He draws on neuroscience–in particular David Rock’s SCARF model–to ground aspects of the model. He also addresses where and how change processes can go astray, and how to address those risks. Each chapter ends with key points and questions for reflection, both of which might be most useful to all of us who are incredibly busy. Most interesting to me, Axelrod helpfully shares key ideas on work design (changing the way the actual work is done) which typically comes after the big corporate change initiative. Here he touches on some of my favorite topics including flow, autonomy, meaning, challenge, and feedback. If you are looking for an introduction to the basics of employee engagement and happiness, I would start elsewhere. If you need an organizational change process that truly engages employees for best success, this is an excellent book. Have you read it? What did you think? What’s your favorite book on employee engagement?